Blood, emblems, and government make their way to European Tera players. Never let it be said that petitions have no power. First, one played a role in bringing Xenoblade and other Wii RPGs stateside, then another sparked a port of Dark Souls for challenge-starved PC gamers. Now, a mere few weeks after vocal European fans requested a little blood and gore in the online world of Tera, publisher Frogster has acceded to their supplications. After first removing the game's blood effects, Frogster will patch them back in next week, along with a few new gameplay features. 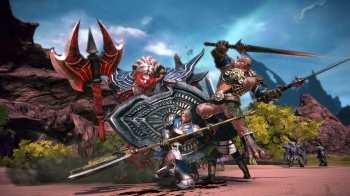 While the game carries a PEGI 12 rating in Europe (roughly equivalent to a T in North America), the ratings board has allowed the blood effects slider to return to Tera, with one small alteration. "The only major difference with the North American version of Tera is the blood splatter effect ... is not going to appear in our version," says Lucile Le Merle, a community manager. "It's going to be a slightly modified effect. But the blood is coming back." The splatter shows up only during the tutorial at present, so its effect on overall aesthetics should be minimal. If that change doesn't get your blood pumping (and really, it should), one other big feature will accompany it: guild emblems. While Frogster initially allowed custom guild emblems, it removed the feature, which led to fans wanting it back almost immediately. "[Apart] from the eventual Nazi symbols or peado/pornographic images, there was also a high threat in terms of security, in case someone wanted to upload a virus," Le Merle explains. A new fix ensures that emblems will exist only in the game's client and leave a player's hard drive out of the equation, although Frogster will still need to remain vigilant against offensive images. Other changes, including chat filter refinements, bug fixes, and an end-game political system, will arrive next week as well, but blood and emblems seem to be the two big selling points of the patch. The obvious way to combine these two features would be to use a drop-of-blood image as a guild emblem. This admittedly only makes sense if you run a guild of vampires, but finding people of that persuasion on the internet should not prove too difficult.